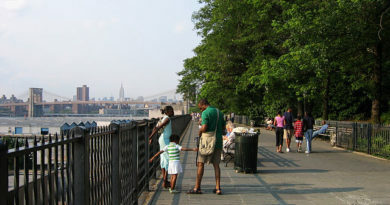 2008 view of the bridge. After 78 years of service connecting Brooklyn and Queens above Newton Creek, the old Kosciuszko Bridge was demolished in a controlled explosion. It took 944 coordinated charges to bring down large sections of the left and right spans of the bridge, which were then carted off. The debris from the bridge will amount to an estimated 22 million pounds of scrap metal. With the destruction of the old bridge, named for a Polish military engineer, Tadeusz Kosciuszko, who was a soldier during the American Revolutionary War, workers can now work on the completion of the second span of the new bridge over the creek. That bridge is due to open in 2020. The demolition caused a delay in traffic of about 5-10 minutes on the Brooklyn-Queens Expressway just before 8am. The explosion was billed in advance as an “energetic feeling”, a term that was made fun of on social media. “An energetic felling. What does that mean? I don’t know,” Cuomo said as people laughed. With the destroyed bridge and new bridge in the background, Governor Cuomo discussed the future of New York City.